Do you matter? Despite it being a pedestrian principle, our patience with the differences we have with others is a good indicator. …taken with a grain of moderation of course:) We all know people who ‘say what they feel’ without any consideration of what others (who do indeed matter) might feel or believe. Point well taken though.Ironic as it is; Dr. Seuss is probably one of the better sources of ‘valuable life lessons’. <>The Butter Battle Book<> is an incisive treatment of conflict (not to mention game theory and deterence) that could teach many leaders and their kids a thing or two. <>The Lorax<> is similarly poinient. The quote fits well for introverted and shy people, but should not be taken as a free ticket for throwing all my mental trash in other people’s faces.We in the western world tend to go a bit far with praising individualism. We might lose on the long run against the east. Let’s keep an eye on modesty and respectfulness. Dr. Seuss is a source of great wisdom. 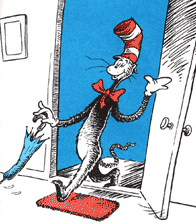 One of my all time favorite stories was Seuss’s < HREF="http://www.amazon.com/gp/product/0394800893/sr=1-1/qid=1156818101/ref=sr_1_1/104-6987805-8097555?ie=UTF8&s=books" REL="nofollow"> “Star Bellied Sneeches”<>. A great story about accepting each others differences.